T.S. Shure ArchiQuest Wooden Farm Blocks Playset & Storybook Only $16.04 (Reg. $40)! You are here: Home / Great Deals / Amazon Deals / T.S. Shure ArchiQuest Wooden Farm Blocks Playset & Storybook Only $16.04 (Reg. $40)! If you are looking for a great gift idea, look now further! Right now on Amazon you can get this highly-rated T.S. Shure ArchiQuest Wooden Farm Blocks Playset & Storybook for Only $16.04 (Reg. $40)! 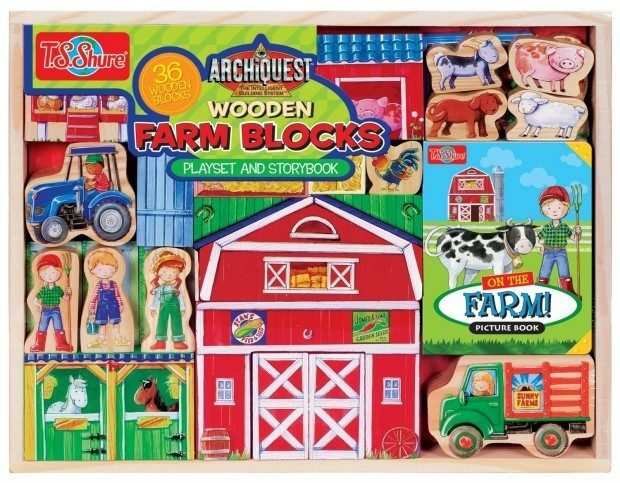 This farm themed building set contains 36 wooden farm themed building blocks and an On The Farm Picture book. Pint-sized builders will use the blocks to create amazing farm stories, and developing building skills. The solid wooden blocks include hand painted art reproduced and permanently laminated onto two sides. This creative set also includes a solid wooden tray for easy storage. This comprehensive heirloom quality building set is perfect for young builders.